Publication date: 2009 This tracking textbook prepares the reader in the basic principles of visual human tracking as they apply to a SAR mission. 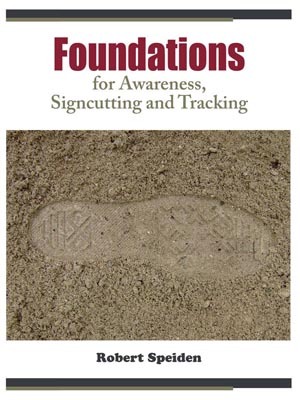 For anyone who needs to interpret, and follow human tracks or sign, this book is for you. In fact, anyone who steps out into the field will become a better searcher, if they learn and use the material in this book. The book serves as the textbook for the 50-hour Field Team Signcutter course certified by the Virginia Department of Emergency Management. Each chapter lists the standards used in the curriculum. The purpose of this book is simple: To become a better searcher by becoming aware of what you are seeing. Robert Speiden has been an active member of the search and rescue community since 1993. As the Virginia Department of Emergency Management Field Team Signcutter course coordinator and through his Natural Awareness Tracking School, he currently instructs SAR professionals, law enforcement officials, and government agents in tracking and awareness skills that enhance search efforts for missing persons. The content is well thought-out and I like the audience focus, which gives authenticity & credibility to the work. The book is of utmost importance; the book clearly describes many of the intricacies of tracking that are needed for the learning practitioners. More important, it promotes the use of deductive reasoning from multiple clues, which is the key to successfully reading sign. The presentation of the elements associated with the art of tracking gives valid evidence that it is a science of observation and deductive reasoning that can be learned and utilized by anyone and applied many venues. The book may be geared to SAR, but any persons interested in tracking people would benefit from the information provided - i.e. law enforcement, military, security, and investigators. It will be a great resource for instructors. We want to hear your thoughts, comments, and suggestions. Tell us what you like about the book, how you have been able to use the material, or other ideas you have about tracking and awareness. Please keep comments within our guidelines.